Does anyone else find it disturbing that Metro would publicly release the addresses of the people who park at a Metro station on a particular day? JJ since it wasn’t person specific – I’m not sure anyone’s privacy was violated. 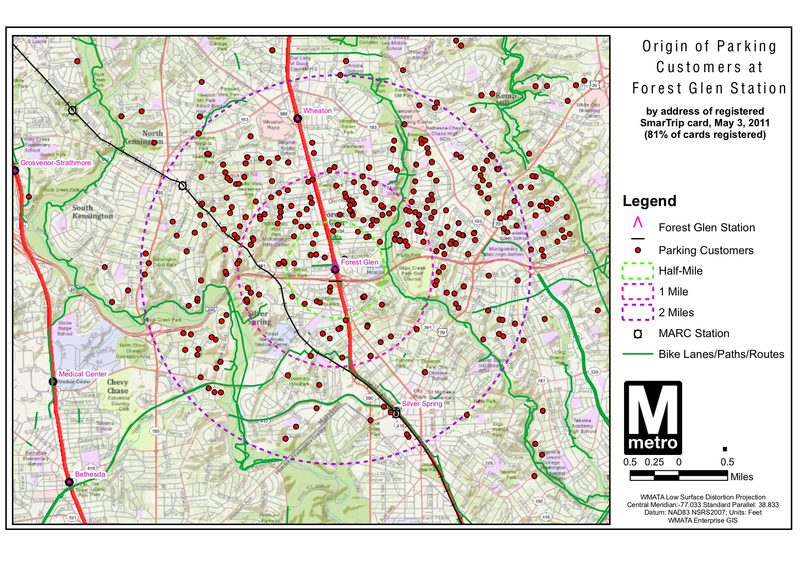 I think WMATA was more interested in getting data. 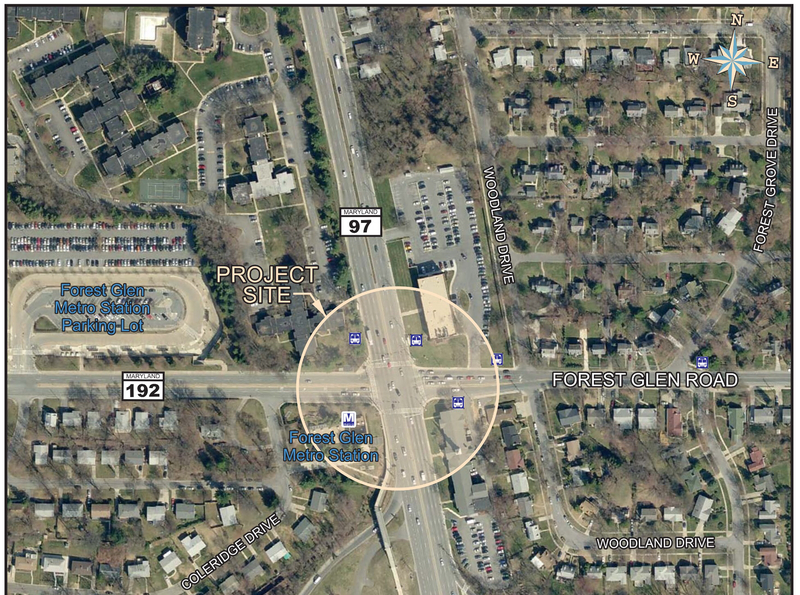 Would like to see the tunnel connect on the south side of the intersection. The connection can go directly to the lobby of the elevators, add turnstiles, shorter tunnel but this can connect to the nice wide sidewalk along forest glen road straight to HCH. Too many folks wind up walking in the street on the north side of Forest Glen Road with the design as proposed on this post. That makes sense Wm. I suspect there were some engineering issues or this would have been the logical design. Building a ramp on the North side of Forest Glen strongly impacts the church and at least two houses. Are you going to ask people to give up their homes so you don’t have to cross the street? MS – the design that was engineering by the County is a tunnel and not a ramp. It would be across the street from the church on the same side as the Forest Glen Medical Center and would not displace any homes. Thanks for posting this! One suggestion: nix the term “tunnel”. 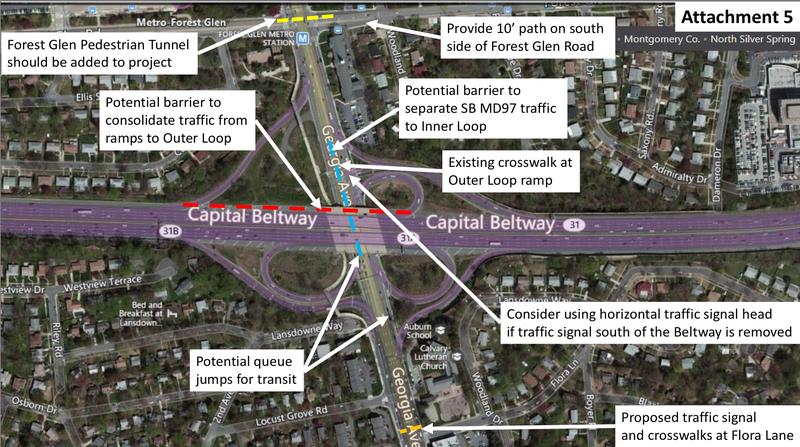 In fact what MCDOT engineered and the Planning Department has approved is an east-side Metro entrance. It will look identical to the existing west-side Metro entrance from the Kiss & Ride and parking lot, only it’ll be significantly shorter. It will merge with the existing west-side entrance passageway right next to the big room with the turnstiles and fare machines. Imagine crossing the intersection diagonally, turning left, and you’ll be at the gates. Is that existing west-side entrance one a “tunnel”? I suppose so, in the same sense that every Metro entrance is a tunnel. But “tunnel” misleads people into thinking we’re talking about a dim grimy concrete-walled scary place with newspapers and trash strewn about and people lurking. That’s not this. Metro will maintain and manage it the same way they do the existing west-side entrance and every Metro entrance. It’ll have the same floor and walls with ads and lighting and gate as the west-side entrance. It’s a Metro entrance, not a tunnel! Re the new entrance being at the NE corner of the Forest Glen/Georgia intersection instead of SE corner, MCDOT evaluated a SE entrance and determined there isn’t enough room there next to the church. 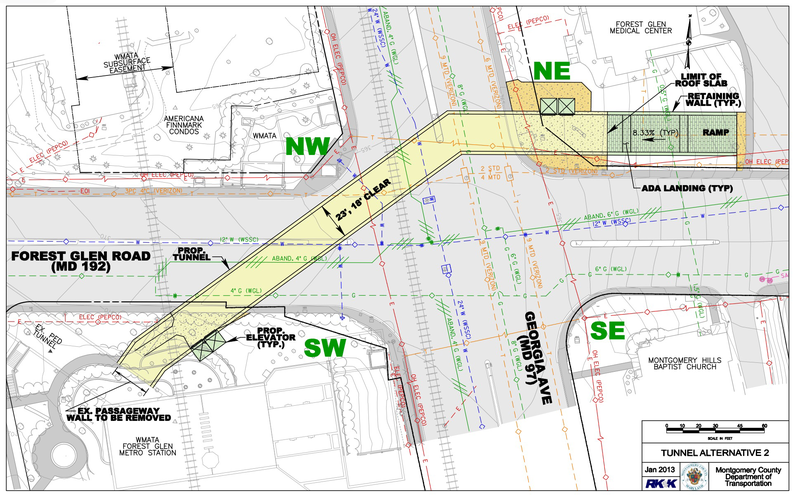 Walking to Holy Cross from the NE corner of the intersection is a long-standing problem that badly needs fixing whether or not a new Metro entrance is built. 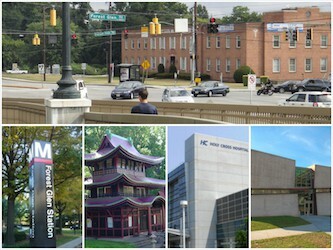 The north-bound Metro bus stops are on the NE corner of the intersection. Many, many people get off the bus at the NE corner and have a hard time getting to the hospital. 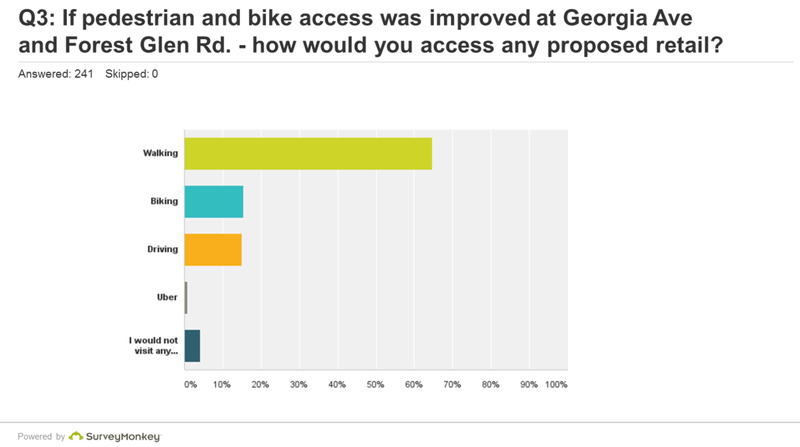 Better Forest Glen crossings are badly needed. A sidewalk along the north side of Forest Glen would be great, though the terrain will make that a little difficult. Hopefully this problem will be fixed before or together with the new Metro entrance, so there won’t be much difference for Metro users going to the hospital whether the entrance is on the NE or SE corner. Meanwhile there are a whole bunch of homes (well over 1,000) within an easy 1/2 mile walk of the NE corner, while the SE corner is hemmed in by the beltway. Also a NE entrance will better serve future development of the Medical Center property. Very excited for a new Metro entrance (not tunnel)!! Great points Ted! 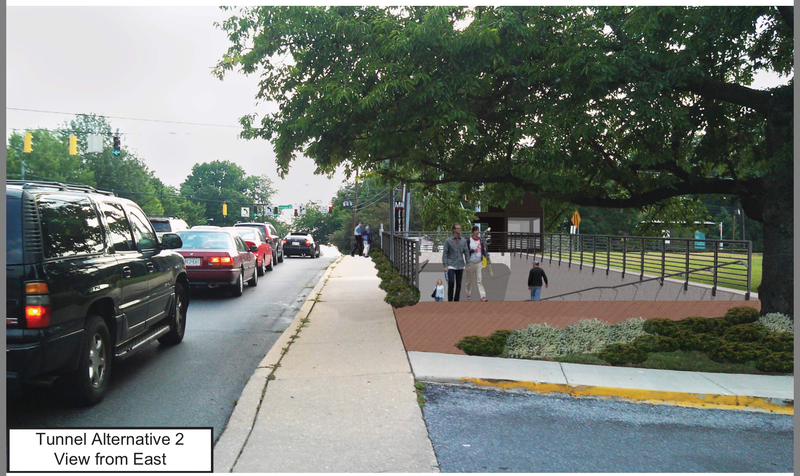 Hopefully the community can come together once more to support the new entrance!